This April, Intercity Transit, in a joint effort with the City of Olympia, will begin construction of a traffic signal at the intersection of Pattison Street and Martin Way, to include site improvements in front of Intercity Transit’s property along Pattison Street and Martin Way. Waunch Construction and Trucking Inc. will be performing the construction services. Construction of the traffic signal will include crosswalks, installation of two traffic poles and relocating private utilities underground. The frontage improvements will include a sidewalk, bike path and landscaping. The bus stop in front of Aztec Lanes will be relocated to a dedicated bus turnout next to Intercity Transit’s property along Martin Way. This project will improve bicyclist and pedestrian safety, transit operations, and vehicle mobility through the corridor. 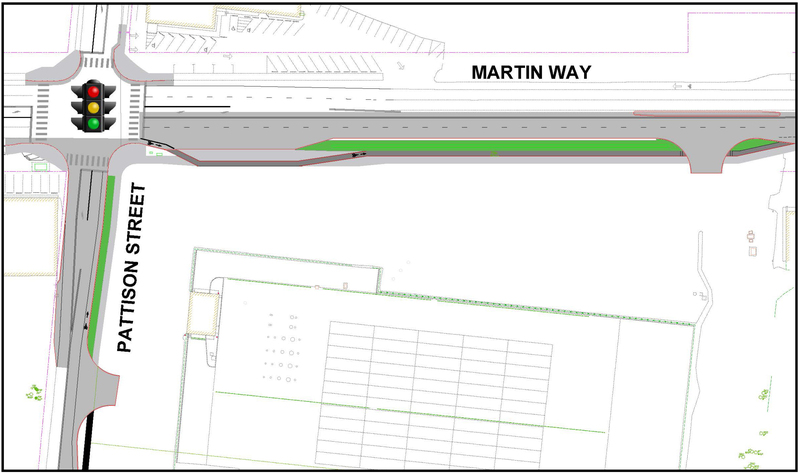 Expect periodic disruption of traffic flow along Martin Way while utilities are being relocated underground. Travelers should expect lane restrictions and minor traffic disruptions throughout the project. Access to Aztec Lanes should not be disrupted during normal business hours. The entire project is scheduled to be completed by late July or early August.